I HAVE JUST RECEIVED a copy of a book that I overlooked for years, although it should have particularly attracted my attention. It is Adolf Hitler: the Medical Diaries, the Private Diaries of Dr. Theo Morell, edited by David Irving (London, Sidgwick & Jackson, s.a., [c. 1983?]). In 1970-1971 I was concerned in an effort, on behalf of Dr. Röhrs, whose work I shall mention below, to locate Morell’s diaries in the labyrinthine archives of expropriated German material in Washington, D.C. The attempt was unsuccessful, and I was inclined to suspect, it seems unjustly, that the diaries were being intentionally kept secret. The eminent historian, David Irving, was more fortunate. The diaries, which he had long sought in vain, were found in the files of the notorious Department of Health, Education, and Welfare (often called “Phew!”) in 1981 and finally sent to the National Archives. The diaries are evidence in an important historical problem which, I am sorry to say, Mr. Irving has not directly confronted, and I am not sure whether his opinion is to be deduced from what he does not say. When Adolf Hitler became Chancellor in January 1933, he was a man of forty-three, and had survived experiences that permanently impair or ruin the health of many men. He had undergone great privations in his youth and early manhood; had been gassed and severely wounded in the First World War, in which he exhibited such courage that he, although only a corporal, was awarded the Iron Cross, First Class. (1) And for eleven years he had dedicated himself to an arduous task that alone suffices to break the health of lesser men. (2) He converted a tiny group of assorted malcontents into a political party that won power with the ardent support of the overwhelming majority of the German people. That required not only political genius and the indefinable force of personality that we call charisma, but extraordinary powers of physical stamina, nervous energy, and mental vitality. When Hitler came to power, he seemed to be, and probably was, in excellent physical health, and of his abundant nervous and intellectual energy there can be no doubt. Hitler was thus prostrated at the most critical juncture in the war, and he was unable to overrule and control his generals about the strategy to be employed in the thus-far victorious war against the Soviet Empire. It is quite likely that Göring was right in his belief that had Hitler’s original strategy been followed, “the eastern campaign would have been decided by early 1942 at the latest.” It would be one of history’s greatest ironies, if microscopic bacteria were responsible for the catastrophe that may have doomed our race and civilization. From that infection, Hitler never fully recovered, and it at least contributed to recurrent maladies that occasionally prostrated him thereafter. His physique was shattered by the dastardly attempt to murder him on 20 July 1944, made by a pack of infamous traitors who are now honored as heroes by the pack of traitors that now misgovern the two thirds of Germany that were recently reunited. The injuries that he received were more serious than the public was permitted to know at the time, and from these also he never fully recovered. To men who knew him in 1940 and 1941, Hitler appeared remarkably younger than his years; in the later part of 1944 he was a prematurely old man. According to Naval Captain Assmann, “The rot…set in on the 20th of July.” In his last days, Hitler was, in Irving’s summary, “a nervous ruin…a physical wreck who could barely walk, doing so with a stooped back and shuffling gait, his right leg dragging, his head shaking, and his left hand violently trembling on the limply dragging arm.” That he retained, at least at moments, his old lucidity is proved by the “testament” in which he, shortly before his death, warned the American people of the consequences of their crime against civilization. They, however, do not even honor him as a prophet. 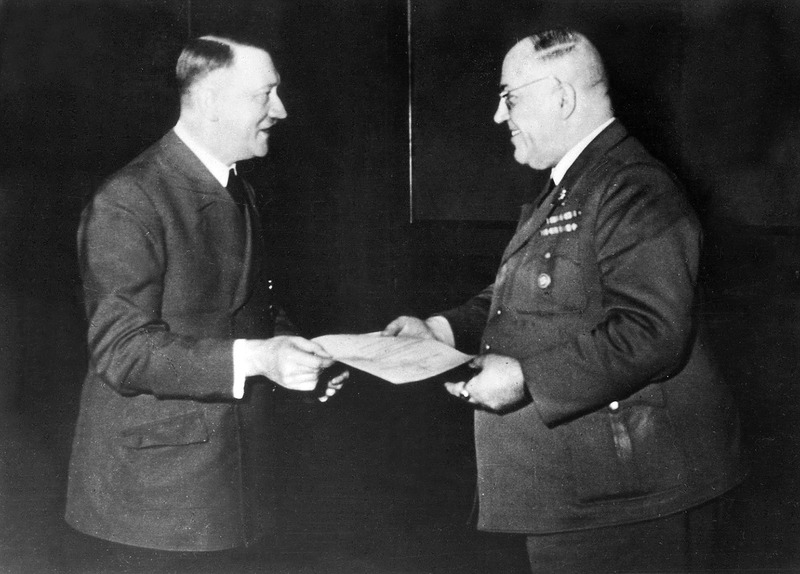 The Captain, who had accompanied Hitler and, with him, survived the traitor’s bomb, was not a physician, but his opinion was shared by all of the physicians who treated Hitler during the war, and a group of them went to Hitler and emphatically warned him that Morell’s drugs were destroying him physically and perhaps mentally. The unexpected result was that Hitler affirmed his unlimited confidence in Morell and dismissed his critics, almost ruining some of them. The simplest question is one that commonly arises when celebrities in the theatre or arts die prematurely. One remembers that the actress called Marilyn Monroe, whose aspirations to become a Mrs. Kennedy were terminated by her sudden and mysterious death, had been treated by two physicians (one also a psychiatrist), who gave their patient potent drugs, one of which produced effects that were precisely antithetical to the effects of the other, thus naturally causing physical and nervous stresses that gravely affected her health and may have destroyed her emotional stability. More recently the death of an attractive though gullible actress has been imputed, in part, at least, to the work of her physicians. A problem in medical ethics is presented by “society doctors,” who are often accused of pleasing the patient and perhaps multiplying treatments, even at the expense of his welfare. The accusations are sometimes, perhaps often, justified. It was in the later 1950s, as I recall, that I met by chance a former student of mine, and when we had cocktails and dinner together, he was lavish in praise of his physician, who, he said, was a prominent “society doctor” and always made him “feel good.” I learned that whenever the man felt less than buoyant, he went to the physician, who gave him an hypodermic injection of cortisone (or could it have been coritsol?). If you are a physician, I need say no more. If you are not, I will add that while cortisone, by accelerating the metabolism of carbohydrates and fats, does produce a sense of euphoria, when a healthy man receives frequent injections of cortisone, the almost invariable result, according to my medical friends, is deterioration of both kidneys and liver, which may trigger a wide variety of diseases. (4) The man died about ten years later, but I did not learn the cause of his decease. Mr. Irving concluded that “Many of Morell’s medicines were quite harmless, and he injected the others in such minute quantities [i.e., the comparatively small doses recorded in the diary] they would have been virtually useless.” This despite the fact that one of these drugs, a sulphonamide (sulphamethylthiazol), manufactured by a Jewish pharmaceutical firm in Budapest in which Morell had a proprietary interest, was known as early as 1940 to damage the kidneys and nervous system, but Morell nevertheless administered it lavishly to all his patients, including Hitler, even for common colds, presumably hoping that its deleterious effects would be mitigated by a high intake of liquids. In this one instance, indeed, Hitler perceived how adversely the drug affected him and refused to take any more of it. Granting that the drugs listed in the diary were not likely to harm at any one time in the small doses Morell records, routine administration of some of them very frequently and sometimes daily could have produced a cumulatively adverse physiological effect as well as a psychologically deleterious dependence on them. Mr. Irving seems to accept Morell’s clinical diary as an authentic record, although he notes that Morell compiled it and multiplied copies of if for use to defend himself, if he should be accused of misconduct. If Morell did dose Hitler with a noxious drug called ‘Pervitin’ (7) as Captain Assmann suspected, he would naturally have refrained from noting it in a record he was keeping to justify himself in a possible investigation. Morell was a basically vulgar man. His childish vanity made him design for himself a polychrome uniform that would have won applause on the stage of a comic opera, and he was aggrieved when the Schutzstaffel would not permit him to adorn it with its proud symbol, the fulgurant SS. It was also vanity, no doubt, that made him the possessor of Germany’s only electron microscope, which he never used and probably did not know how to use. He was mercenary, perhaps avaricious. He used his illustrious patient to force on the German army the doubtless salubrious vitamins manufactured by one of his pharmaceutical plants, (10) a drug that he falsely described as the equal of penicillin, and a worthless insecticide, manufactured in enormous amounts in a factory commandeered and given to Morell at Hitler’s order. (11) And Dr. Brandt, before the Americans murdered him, described Morell as a “greedy business man, not a physician,” and reported that Morell had proposed to send patients to him for surgical operations and mutual profit; although the practice is now common in the United States, Dr. Brandt thought it unethical and indignantly refused. It will be obvious that if Morell was not a Sheeny, he certainly resembled one in both personality and conduct; he was the kind of individual whom healthy Aryans instinctively dislike and contemn. That fact must be taken into account in any sincere effort to judge him as Hitler’s physician. It cannot be denied that Morell, quite apart from his success with psychosomatic patients, did effect genuine cures, largely because he was willing to employ new therapeutic agents, such as vitamins, (12) especially if they were manufactured by one of his pharmaceutical plants. It is also undeniable that Morell often behaved as a quack. Morell’s ascendancy over Hitler from the first until shortly before the end, (13) seems inexplicable, even when we know that the wily physician was wont to lecture Hitler on the magnitude of his burden of responsibility, and to avow that he, Morell, was the only physician in the world who understood the physical consequences of that burden and could enable Hitler to bear them. He even had the effrontery to claim that, but for him, Germany would have been finished in the first years of the war! Hitler was certainly not a fool, although he was often uncritically indulgent toward men whom he esteemed and in whom he had confidence, and, as an Aryan, felt an obligation of gratitude and loyalty to men who seemed (e.g., Admiral Canaris!) loyal and devoted to him. But how can he have failed to be repelled by Morell’s shameless vaunts? That, it seems to me, can be explained only as a continuation of the almost total ascendancy over Hitler that Morell established from the very first. That Morell’s medication at least contributed greatly to, if it was not the primary cause of, the deterioration of Hitler’s health seems certain. That poses the question whether he did so as a quack or deliberately as an enemy agent. That, astonishingly, is a question that Mr. Irving ignores, unless we are to assume that his silence is to be taken as a rejection of any suggestion of Morell’s guilt. The historian’s evasion of the crucial question is the more astonishing since he cannot but have been aware of the impressive and medically explicit book by Dr. Hans-Dietrich Röhrs, who, as one of the last living members of the Reichsgesundheitsfhrung, undertook to establish what he regarded as an historically certain fact in his Hitler, die Zerstörung einer Persönlichkeit (Nekargemnd, Vowinckel, 1965), of which the second edition appeared under the title Hitler’s Krankheit (ibid., 1966). The first of these was translated into French, Portuguese, and perhaps other languages at the time, but no English translation has thus far appeared. Hitler bore the awful responsibility of commanding the last great effort to save our race and civilization from the crazed members of that race who were determined to destroy both, and it is admittedly difficult, almost impossible, to estimate the effects of that burden on a conscientious and resolute man, but Dr. Röhrs, an eminent physician of long experience, on the basis of careful consideration of the slow alteration of Hitler’s health and personality, compared with the known effects of ‘Pervitin’ and similar narcotics, came to the conclusion that Morell deliberately and with malice prepense gradually poisoned Hitler to cause the defeat of Germany and of all that depended on that nation. The book will, I think, convince any objective reader that Dr. Röhrs’ conclusions must be taken into account. I am equally astonished that Mr. Irving simply ignores another fact which can be variously explained, but cannot be simply disregarded by an historian. Morell, as I have said, escaped from the bunker under Berlin, but he fell into the hands of the Americans, who not only subjected him to brutal interrogations, but tortured him atrociously. He was eventually imprisoned in Dachau, which is infamous, not for what the Germans are said to have done to Jews, but for what Americans there did to Germans. He said that, among other things, they pulled out his toenails, one by one. We may hope, of course, that the torturer was not an American, but one of the innumerable Sheenies in American uniforms and with commissioned rank that the Americans loosed on the German people, but we cannot be sure of that. After all, the Americans were engaged in a holy war for the holy people, and they normally lose all contact with humanity when they have been pumped up with righteousness. Mr. Irving has seen the records of the interrogations to which Morell was subjected, and he must know that, according to reports which have never been questioned, Morell, when first arrested, averred that he loved Jews and that he had “deliberately poisoned” and destroyed Hitler with his drugs to procure the defeat of Germany. If we are Aryans and uninfected by the lofty idealism of Bushy and his kind, we must feel, as does Mr. Irving, compassion for Morell. When his wife was finally permitted to see him for a few moments, under the supervision of two uniformed thugs who enjoyed insulting and mocking her, he was no longer sane and could only repeat over and over again that he thought her dead. Mr. Irving plausibly suggests that he had been subjected to one of the Americans’ favorite amusements. The prisoner was forced to listen, sometimes for hours, to piercing screams from the adjoining room, which, he was told, were the cries of his wife as she was being tortured and finally killed because he would not give them information he did not have — or just because they wanted some fun to relieve the monotony of their days. We pity him, but there remains the confession, which might, after all, have been true, (17) and the record that Dr. Röhrs studied. Dr. Röhr’s conclusions receive some substantiation from Morell’s known connections. His closest friend was a gynaecologist named Dr. Wohlgemuth, who was eventually discovered to have been a member of the famous Communist espionage and murder organization, “Die rote Kapelle,” and who somehow inherited Morell’s office on Kurfrstendamm. Morell’s friend and chief chemist at his pharmaceutical plant in Olmtz, Dr. Kurt Mulli, was identified, as Mr. Irving does not tell us, as a Communist (Jewish?) agent and accomplice in the escape of Dr. Otto John in 1954. A scrutiny of Morell’s circle of associates would probably reveal other connections. There is finally the consideration that Morell, even if a cynical quack, was sufficiently competent in medicine to know what effects his drugs would have on Hitler. Even if he did not administer ‘Pervitin’ or a similar drug in his unexplained “Vitamultin-forte,” he must have known the probable consequences of injecting a man with glucose and “harmless” drugs every day. I do not affirm that Dr. Röhrs is correct. As I have said, every datum can be explained in more than one way. Morell’s diary may be either an accurate clinical record or precisely what a scoundrel or traitor would prepare as evidence of his innocence. The disease that struck down Hitler in July 1941, whether contracted by accident or murderously induced, may have inflicted damage that no therapeutic art could repair, or it may have given Morell an opportunity to intensify and prolong its effects, and thus to begin the destruction of Hitler’s body and mind in earnest. The same is true of the attempted assassination in July 1944, its effects augmented by the traumatic discovery of treason among his closest and most trusted associates, and the horror of having seen loyal friends horribly mutilated and dead or dying. Dr. Röhrs, however, is a man of distinction and courage, and his work will impress you with his knowledge of pathology and his absolute honesty in his analysis of the record, whether or not he is right. I have written now because I want you to be aware of an important historical question, and, if you have read or will read Mr. Irving’s book, I urge you also to read the book by Dr. Röhrs that he so strangely fails to mention.